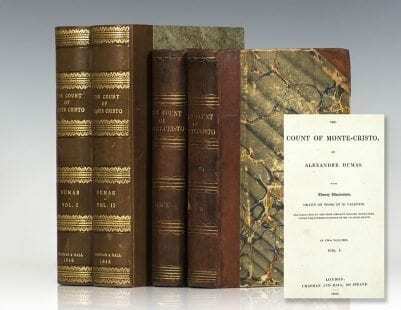 The Works of Alexandre Dumas [The Count of Monte-Cristo and The Three Musketeers]. 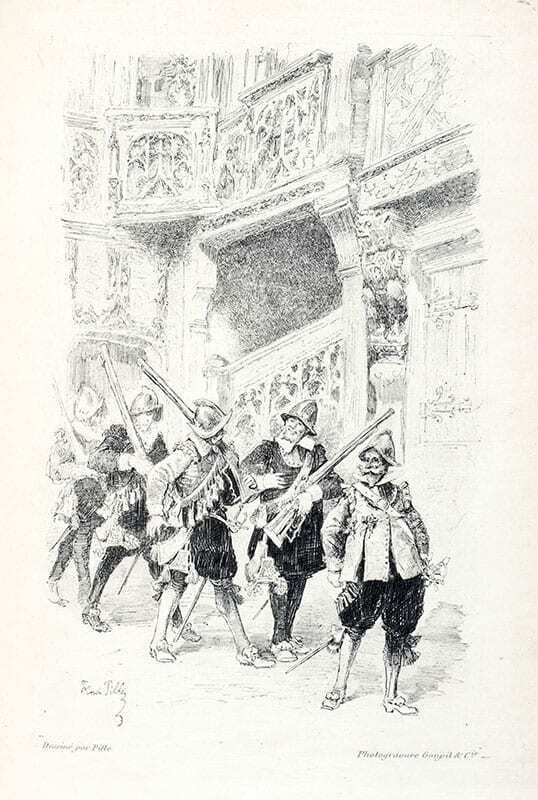 The Works of Alexandre Dumas, Including: The Count of Monte-Cristo, The Three Musketeers, Twenty Years After, and The Vicomte de Bragelonne: Ten Years Later. Boston: Estes and Lauriat, 1895. 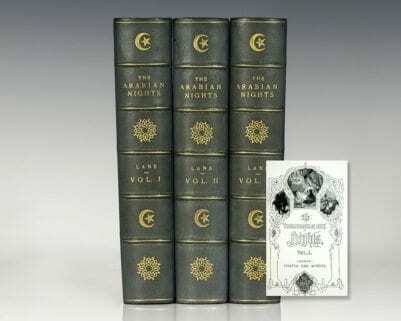 The international limited edition of the works of Alexandre Dumas. Octavos, 40 volumes, bound in three quarters morocco over marbled boards, gilt titles and tooling to the spine, raised gilt bands, top edge gilt, marbled endpapers, engraved frontispiece with tissue guard to each volume, illustrated. One of only 1,000 sets, this is number 964. In near fine condition. An exceptional collection. The Count of Monte Cristo, in particular, is "perhaps the outstanding work of fiction to reveal the futility of human vengeance, even when it attains its utmost completeness. Maurice Baring calls it the most popular book in the world" (Frank Wild Reed). "One of the best thrillers ever written" (Reid, 134). London: Chapman and Hall, 1846. First edition in English of the author’s masterpiece, published just one year after the original French edition and before the American first. Octavo, 2 volumes. 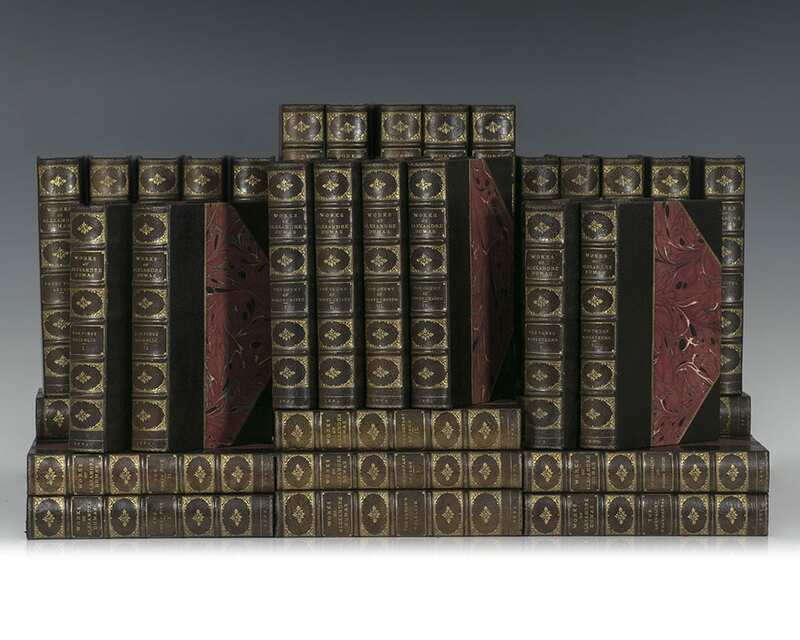 Bound in full contemporary brown calf, gilt titles and tooling to the spine, gilt ruled to the front and rear panels. Twenty wood-engraved plates after Henry Valentin. In near fine condition with some light rubbing to the extremities. Rare and desirable. Le Comte de Monte-Christo [The Count of Monte-Cristo]. Bruxelles: Societe Belge de Librairie, 1845-1846. 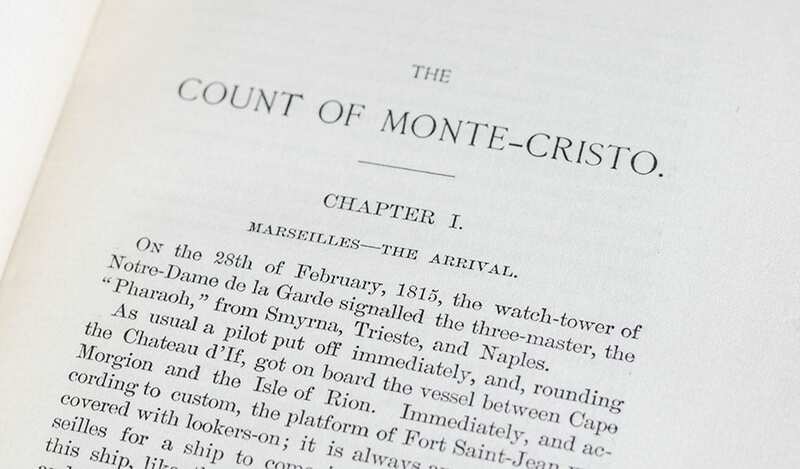 One of the earliest known editions of The Count of Monte Cristo released simultaneously with the true first edition published in Paris by Pétion in 18 volumes with the first two issued in 1844 and the remaining sixteen in 1845. 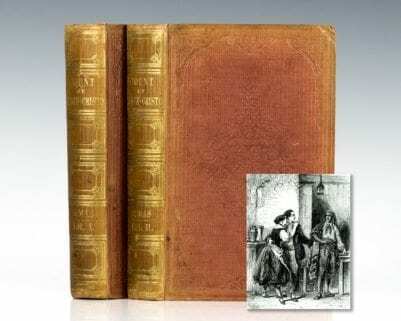 This Belgian pirated edition features a misspelling of the title with “Christo” which was corrected in the L’Écho des Feuilletons illustrated edition, Paris 1846 with plates by Gavarni. Eight volumes. Small octavos bound in full period green calf over pebbled morocco, gilt titles and tooling to the spines, raised bands, all edges hand colored green, ribbons bound into each volume. In very good condition with some wear to the extremities. OCLC locates only one other copy of this work. Exceptionally rare. Le Comte de Monte-Cristo [The Count of Monte-Cristo]. Paris: Bureaux du Journal Le Siecle, 1846. 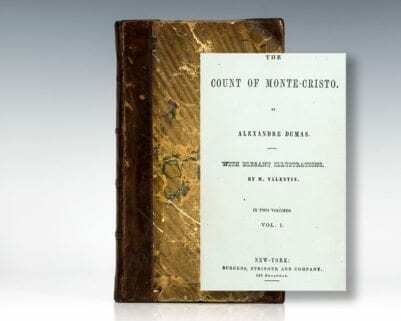 One of the earliest known editions of The Count of Monte Cristo. Bound in contemporary half leather over boards. In very good condition with wear to the bottom cloth and extremities. Illustrated with the frontispiece portrait and 29 plates on thicker paper by Gavarni, Johannot and others, each with a tissue guard. This copy includes plates, rarely found in this scarce edition. There are no copies of this edition recorded in OCLC or the Bibliotheque Nationale de France, and in the last twenty-five years no copies have appeared at auction. 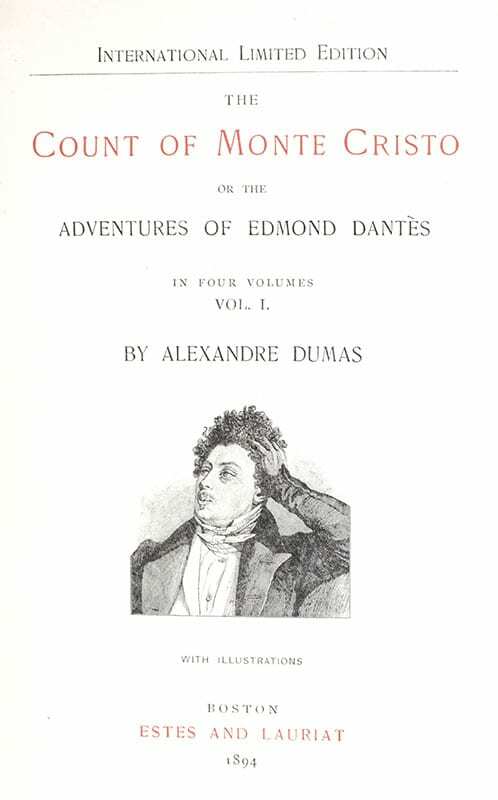 The Works of Alexandre Dumas, Including: The Count of Monte Cristo, The Three Musketeers, Twenty Years After, and The Vicomte de Bragelonne: Ten Years Later). Boston: Estes and Lauriat, 1893-1896. 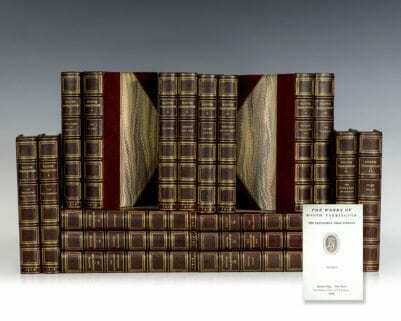 Finely bound complete set of the works of Alexandre Dumas. Octavo, 54 volumes. Bound in three quarters blue morocco by Sangorski and Sutcliffe, gilt titles and tooling to the spine, gilt ruled to the front and rear panel, top edge gilt, illustrated, tissue guards present, marbled endpapers. In very good condition. London: London: Chapman and Hall, 1846. First edition in English of the author’s masterpiece, published just one year after the original French edition and before the American first. Octavo, 2 volumes, original publisher’s terracotta cloth, decoratively blind-embossed, gilt titles to the spine. Twenty wood-engraved plates after Henry Valentin. In near fine condition with only light rubbing to the extremities and toning. Housed in a custom half morocco clamshell box. A superior example, scarce in the original cloth. New York: Burgess, Stringer and Company, 1846. 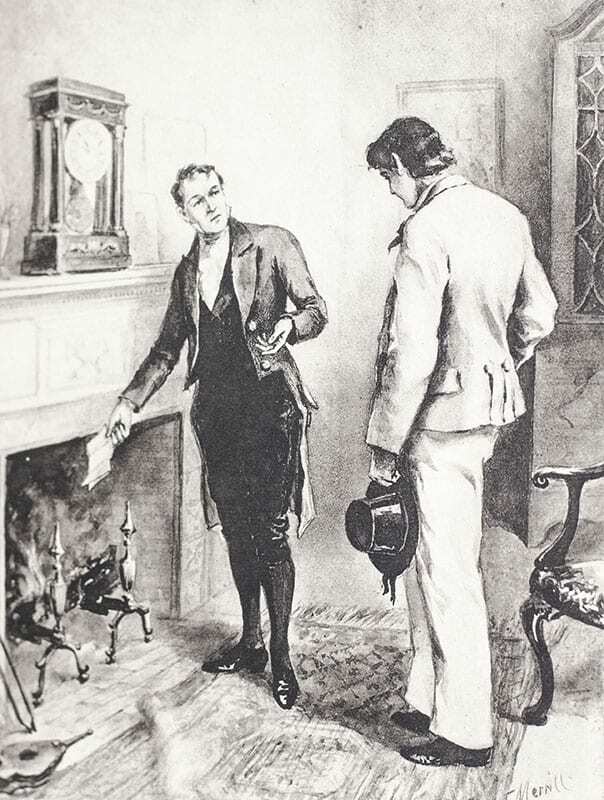 First American edition of the author’s masterpiece. Octavo, contemporary three quarters calf over marbled boards, marbled endpapers, two volumes bound in one. Separate title page for each volume. Complete with twelve illustrated plates. In very good condition with the previous owner’s signature of volume one. First editions in the English language are rare, with Yale being the only library to house a copy of this first edition. First edition in English of the author’s masterpiece, published just one year after the original French edition and before the American first. Octavo, 2 volumes. Bound in contemporary three quarters calf over marbled boards, gilt titles to the spine. Twenty wood-engraved plates after Henry Valentin. In near fine condition with some light rubbing to the extremities. Housed in a custom half calf clamshell box. 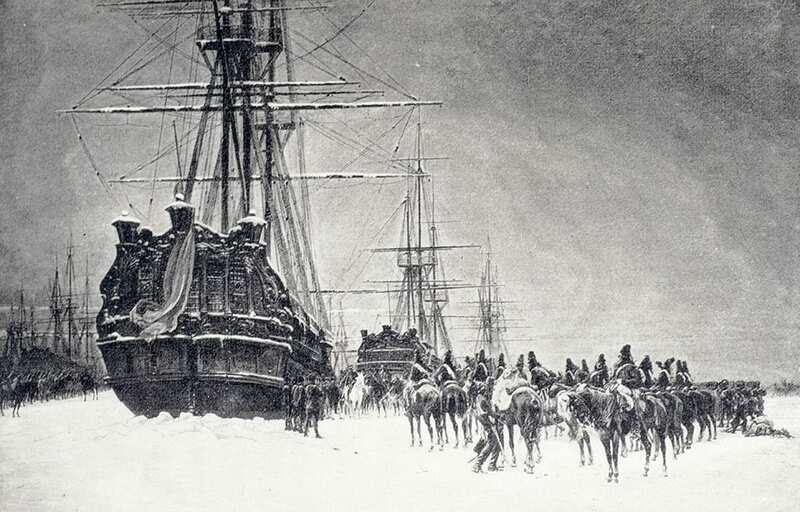 Imperial edition of Dumas’ Celebrated Crimes. Octavo, eight volumes. Bound in three quarters morocco, gilt titles and tooling to the spine, raised gilt bands, top edge gilt, illustrated with photogravures after original drawings by De Los Rios, Prodhomme, and Wagrez, lettered tissue guards. 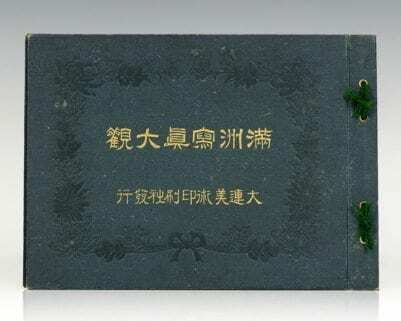 One of only 500 numbered sets, this is number 433. In near fine condition. A stunning set.